Fuel storage and industrial yards at South Dock. 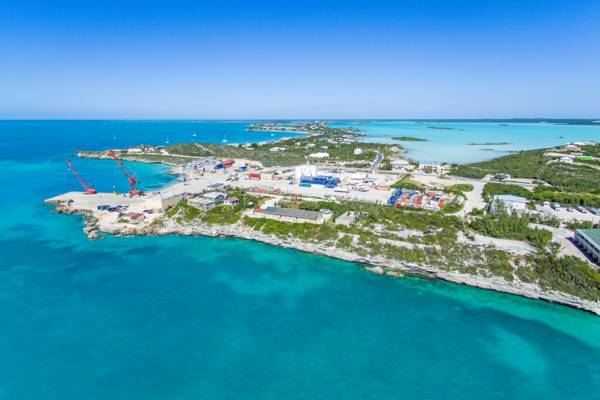 This is the main port of the Turks and Caicos. This area is found on the southern coast of Providenciales. Along with being the site of the main Government-owned sea port for the country, the South Dock area is home to many of the island’s industrial sites. The Sapodilla Bay Hill Rock Carvings are located on the hill overlooking the port. This hill separates the dock from the residential area of Chalk Sound, home to a wide array of luxury vacation villas and the Chalk Sound National Park. 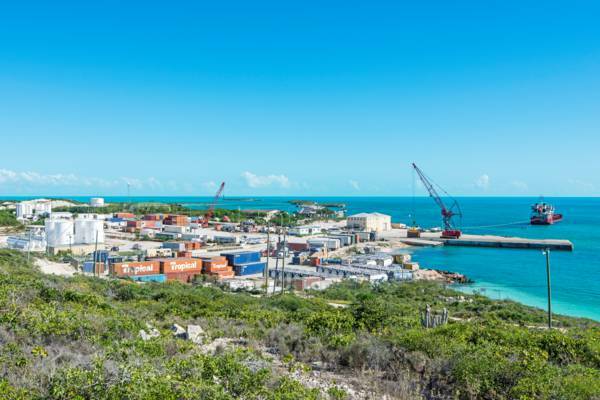 South Dock was formerly known as Gussy Cove and was constructed in 1984 to accommodate the increase in shipping that the newly built Club Med Resort in Grace Bay was expected to bring. As the nearby rock inscriptions carved by waiting sailors may suggest, this area was naturally a useable port, and was utilized as such in previous times. To the east of South Dock is the settlement of Five Cays, which features a beach and island restaurants. South Dock from the air. South Dock handles 85% of the national port traffic (2012 data). Due to the small size of the port, only ships of about 110 TEU size (twenty-foot container equivalent unit) can berth. Draft at the port is also quite shallow at around 11 feet. As a result of these factors, the cost for shipping a container from Miami, Florida (around 575 miles) is on par with shipping rates from the US to Asia (5,000 to 6,000 miles). At this time, a local company, Provo Stevedoring, handles the offloading of vessels and port management.